Laparoscopy is called also Keyhole surgery or Minimally Invasive Surgery. Laparoscopy allows your surgeon to reach the inside of your abdomen (tummy) without making a large incision in the skin and muscles. Laparoscopy is done through keyhole-sized cuts (less than one inch) on your abdomen. Special tubes called ports or trocars are placed into your abdomen through these small cuts. The abdomen is expanded with carbon dioxide gas to create working-space. 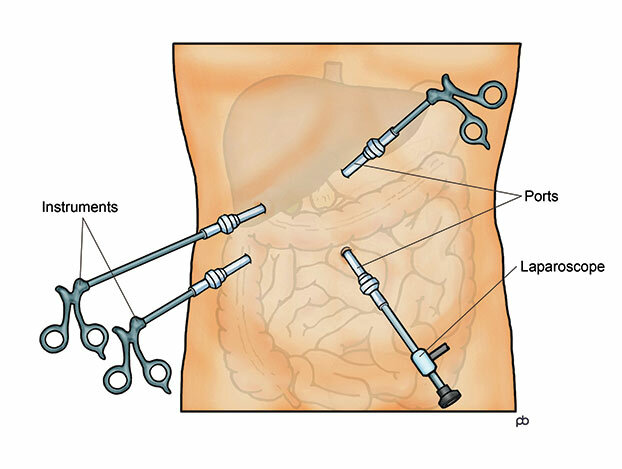 A laparoscope and surgical instruments are passed into your abdomen through these ports. The laparoscope is a thin, telescope-like device that acts as a source of light and a camera. A magnified picture of the inside of your abdomen is projected onto video screens. The surgeon places instruments into your abdomen through the trocars and he works by looking at the picture on the screens. At the end of the operation, the gas is let out from your abdomen and the keyhole sized cuts are closed with stitches. The stitches on your skin are dissolvable, and stitch-removal is not needed. State-of-the-art technology is used to minimize damage to your body tissues whilst performing surgery by laparoscopy. There are many benefits from laparoscopy. Your recovery is quicker, your hospital stay is shorter and you have less pain than if the same operation was done by open surgery. Less pain and faster return to normal activities reduces your risk for complications like pneumonia and thrombosis (blood clots). Laparoscopy is done by looking at magnified images of the inside of your abdomen (tummy) on video screens. The magnification allows surgery to be done precisely and meticulously. Many studies have shown that the metabolic and immunological response of the human body is more favourable with laparoscopy than with open surgery. Since the incisions are tiny, there is less scarring. This advantage is not only cosmetic. Apart from less scarring on your skin, there is also less scarring inside your abdomen. Scarring inside the abdomen creates adhesions to the bowel. Adhesions can cause pain, blockage of the bowel, female infertility and increase the risk of complications during any subsequent abdominal operation. Such problems are far less after laparoscopy than after open surgery. As mentioned above, any incision that is made through the muscles of your abdomen will heal by the formation of scar tissue. This scar tissue becomes an area of weakness in your abdominal wall. A hernia – called an incisional hernia – can develop through this area. The risk for hernia after an open operation is about 10-20 times greater than with laparoscopy. Can all operations be done by Laparoscopy? Laparoscopy can be used for almost all operations in your abdomen. Ultimately, whether laparoscopy is suitable for you depends on the nature of your individual problem and your personal medical history. Mr Sarela is very experienced in keyhole surgery for all the conditions that are explained on this website. He performs almost all operations entirely by laparoscopy. But, open surgery can be better or safer in some cases. Are there any special risks with Laparoscopy? For your surgeon, laparoscopy can be technically more challenging than operating though a large incision. But, the incisions, whether keyhole or large, are for the purpose of getting to the inside of your abdomen. Once inside, the procedure is the same usually. If your surgeon is well trained and experienced in keyhole surgery, then the risks should not be any greater than open surgery. In fact, the risks with laparoscopy usually are lower because there is lesser trauma to your body and quicker recovery. Laparoscopy does have some limitations and special risks. Rarely, there may be injury to your bowel or blood vessels whilst placing the laparoscopy tubes (ports or trocars) into your abdomen. Such risks exist with open surgery, too. But, injuries can be more difficult to recognise and to fix with keyhole surgery. If there is some unexpected complexity or complication during a keyhole operation, it may become necessary to change over to open surgery. This is called conversion. The keyhole instruments are taken out and a cut of the required size is made. This will be done whilst you remain under general anaesthesia, so you will get to know of it only once you wake up. Deep vein thrombosis (DVT) is the formation of blood clots within veins, usually in the calves or thighs. Pulmonary embolism (PE) is a condition in which a clot becomes free from a vein, travels through the heart and lodges in the artery of the lungs. There is risk of DVT and PE after surgery. You are at increased risk for thrombosis if you are obese, or have cancer, or smoke or have had DVT or PE in the past. DVT and PE are serious problems, and can become life threatening. Several precautions, like injection of a blood-thinner drug (called low molecular weight heparin), compression stockings and calf-pumps, are taken to prevent thrombosis.